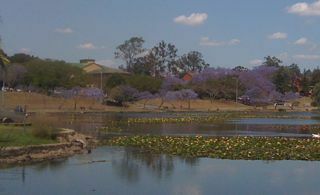 What a treat to cruise around Brisbane at the moment, with the brilliant blue skies as a backdrop to the vibrant mauve of the Jacarandas sprinkled around the suburbs and city, often planted in groves and forming stunning purple avenues. 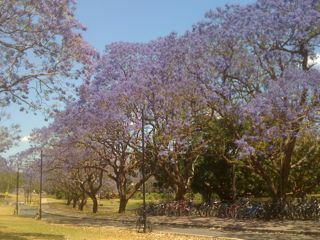 It seems to be a particularly good year for Jacarandas. 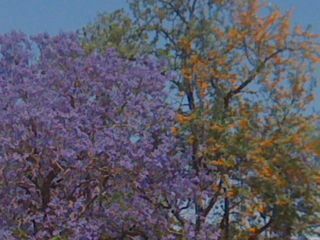 Everywhere you look, these trees are blossoming with the vibrant colour that in the first week or so is almost luminescent. 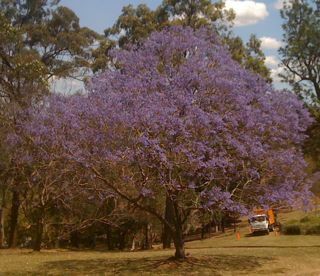 Jacaranda time overlaps with the blossoming of Silky Oaks (which comes towards the end of October in Brisbane), those stately native forest trees that have a brilliant orange blossom. Often the two trees are planted side by side and the effect is nothing less than stunning. As the purple blossoms fall, a beautiful mauve carpet is created around the base of the tree with a stunning effect. 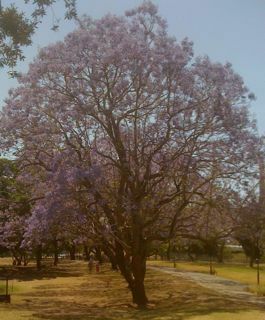 Jacarandas originate from subtropical South America, more precisely, according to the Burke's Backyard factsheet on them, from Brazil. In any case, these attractive trees are now spread throughout the world, and have been planted extensively in Nepal (of all places! ), throughout the Americas and Caribbean, and have also been introduced to Australia, New Zealand, India, Fiji, Portugal and parts of Africa. The genus name is also used as the common name. 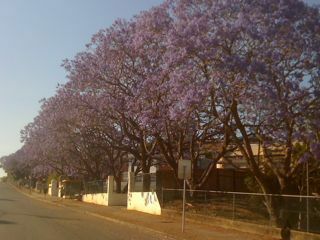 So there you go, look up in wonder, and enjoy, because soon Jacaranda season will be over for another year!